Hiya guys. I cannot believe I almost missed out on shark week! All through the week I have seen some pretty fantastic manis around social media and totally felt left out. Last night I sat down to watch some good ol' cable and the cult classic known as Jaws was on. This has always been a movie that completely throws me back to my childhood when I would cuddle up with my mom and watch 'thriller/horror/' movies. It wasn't the typical bonding experience, but I enjoyed it all the same. But enough rambling, here's the nail art I came up with. As I said, I was watching Jaws so this is very inspired by the movie poster. I was considering adding the movie title on my ring nail, but I felt entirely too tired haha. Plus I've always been terrible at letters. For the gradient I used polishes from Essie: Private Wedding, Make Some Noise, and Salt Water Happy. Whenever I do a gradient it feels like cheating if I don't use the magic that is Fairy Dust from China Glaze. Now the actual nail art is done completely with acrylic paint from American Crafts using a detail brush from Pure Color. I really wish I was better at shading so I could of added some more dimension to my little killer. And my human swimmer... well... that's not talk about her. I tried so hard! Haha. But I am really happy with how it turned out and the fact that I ended up doing something at all. So what do you think about my shark week mani? Did you guys do anything for shark week or not a fan? Thanks for all the well wishes, only two more days to get through and I'm a nervous wreck. Any advice for anxiety is also appreciated! This is awsome!!! One of my fav movies btw! Thanks! Definitely one of mine too. Cute! I like your little swimmer! Haha thanks I was so iffy about her at first. The shark came out so great! Your shark nail is brilliant! I love the gradient too though, it's beautiful. omg i absolutely love the person swimming!! sooo adorable! These are awesome! 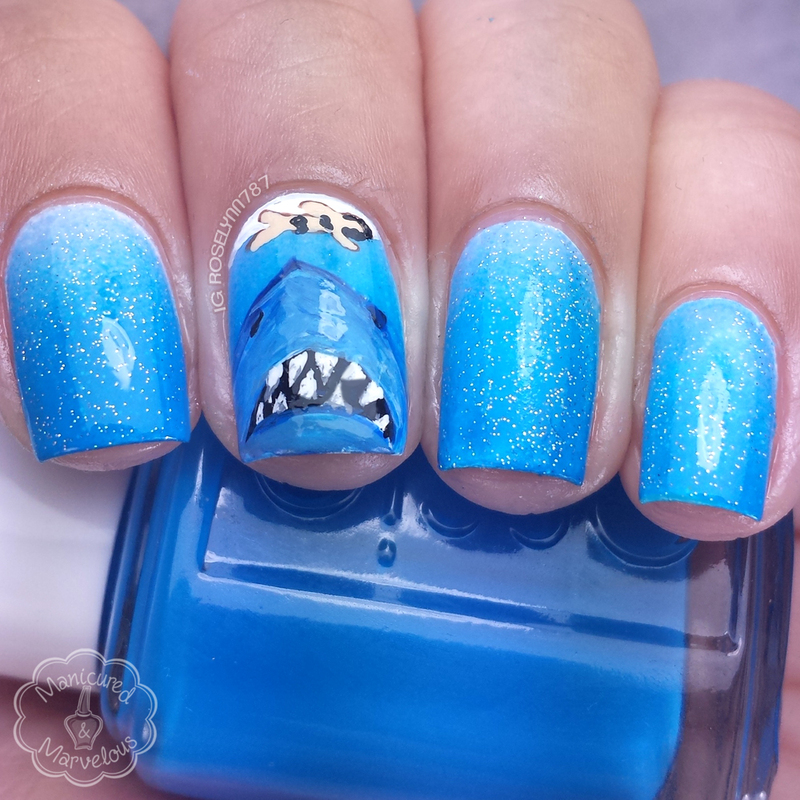 I want to say that the shark is cute, but that feels wrong haha! I love this! The gradient is perfect and the nil art is fantastic! The swimmer is so cheeky! 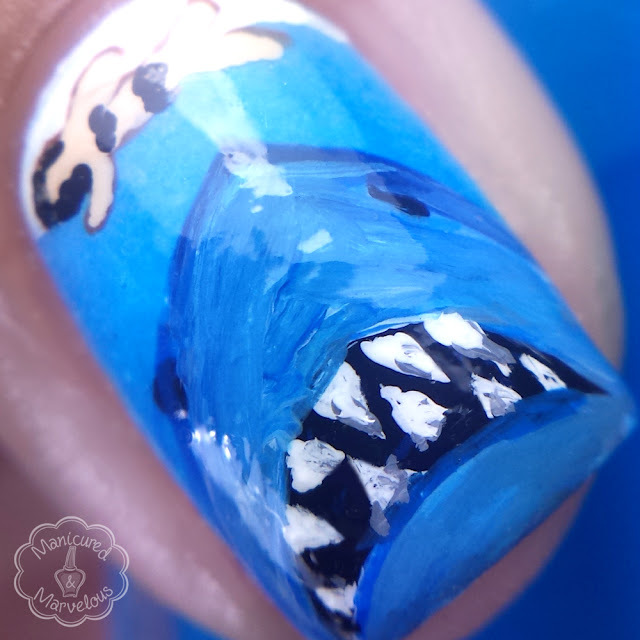 Top notch shark week-ing! Man, everyone's shark week game is on point and I'm sitting around thinking "wait, where did my regularly scheduled Deadliest Catch go?" 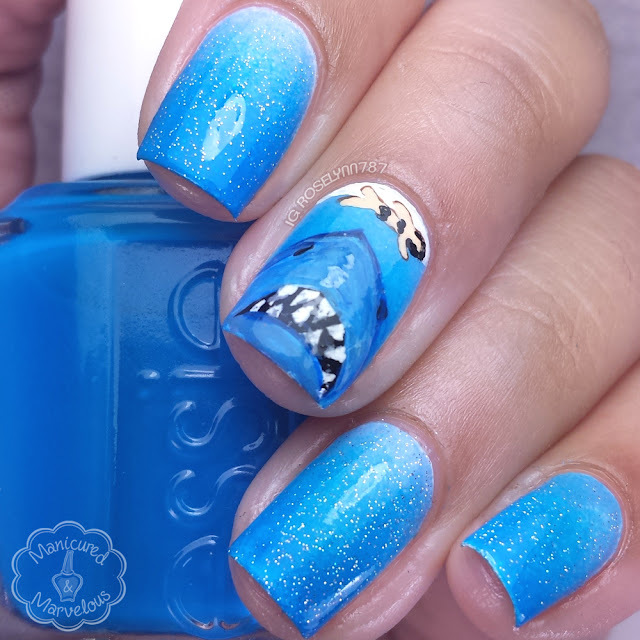 I never really got the hype around shark week, but I do love your mani for it! 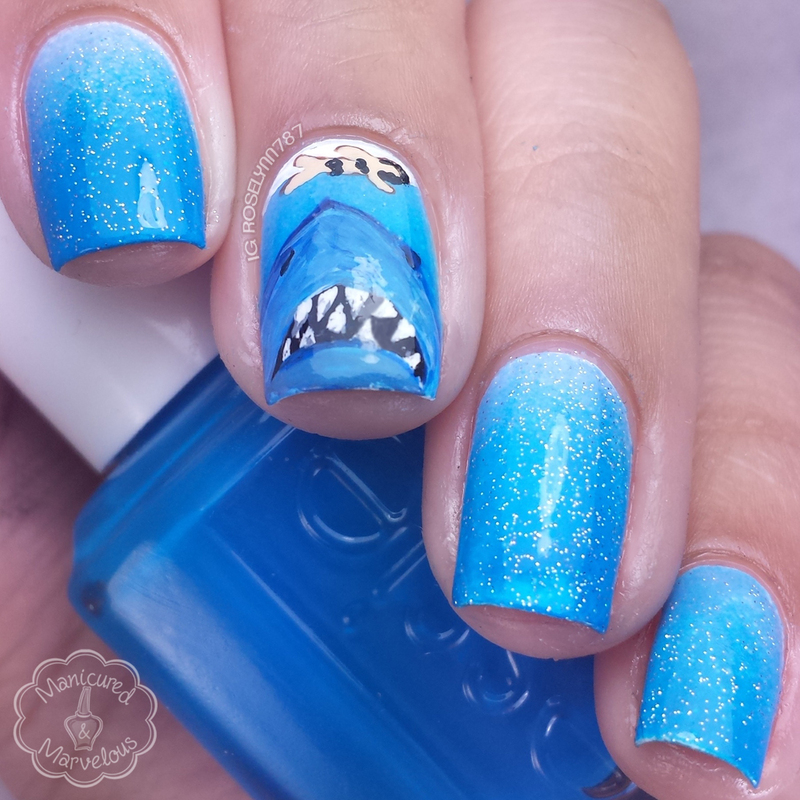 So many Shark Week manis! lol I feel a little overwhelmed because I've never watched Shark Week. This so really neat! Really love your swimmer! I've never watched or taken part in shark week. Maybe next year!